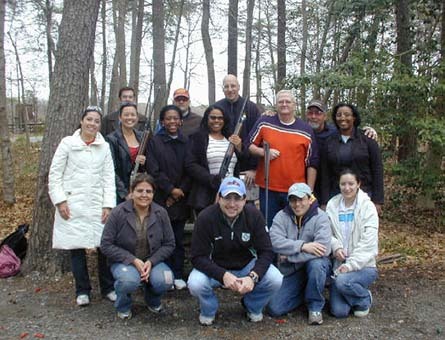 Shooting Star Shotgun Sports, LLC can accommodate large corporate events with up to 100 shooters. Our group shooting package is perfect for professional organizations, social clubs, small businesses, and law firms. We always have an instructor present with every group, so people who have never shot before can participate. We strive to make sure that everyone has a great time. Let your imagination be the limit. Our events can be catered under our pavilion or tents. We can offer a unique day that your guests or clients will always remember. Please call for more information on how we can create a special day that's perfect for your organization. Our All Inclusive Package is a 2 hour event. It provides all the equipment, safety, rentals, ammo and Certified Instructors for $85/person (minimum 6 shooters). It allows each shooter up to 50 shots on our Sporting Clay area. If you would like to add a self-served BBQ lunch from Adam's Ribs, add $30/person (minimum 12 shooters).